Mr Mark Carney, the highly respected governor of the Bank of England, has been dubbed the high priest of ‘project hysteria’ after he gave his analysis of what would happen next year if the UK did not manage to get a deal with the EU on it’s terms to leave the 27-member-states bloc. At the moment, a deal presented by the UK PM Ms Theresa May and agreed with the EU is on the table but it is highly unpopular. The British Parliament will have to vote on that deal on 11 December. If the deal fails to pass the Parliament vote (and all signs point to that at the moment), there may not be time left for the UK to renegotiate a leaving deal with the EU. Mr Carney painted a very bleak picture of what would happen to the UK economy if they left the EU without a deal, stating that in case of an unlikely “disorderly no-deal” Brexit, the economy would contract by 8%, house prices would tumble by 30% and interest rates would rise to combat inflation. He also estimated that the pound would drop in value to such an extent that it would be worth less than the US dollar. Related coverage : Brexit – PM May Ordered To ‘Stand Up To Brussels Bullies’. 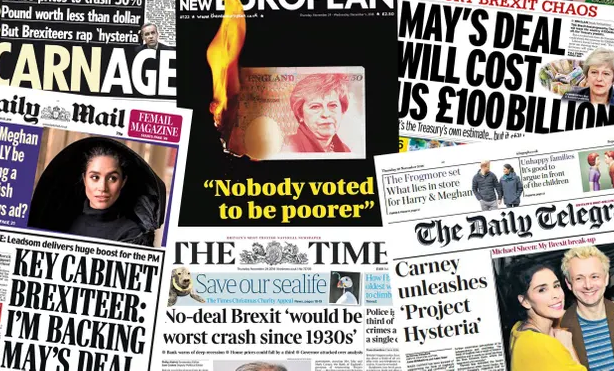 The Daily Express also quoted Brexiteer Mr Rees-Mogg with it’s headline: “Bank boss Carney’s ‘Project Hysteria’” and showed its leanings by leading not with the straight news of Carney’s comments but with the fact he “faced a furious backlash”. The UK government will start discussing the Brexit deal of Ms May as from next Tuesday.